Home » Trusted Proxies Blog » The Death Of The Laptop? The Death Of The Laptop? Will Microsoft’s Third Generation Surface Finally Send Laptops Six Feet Under? Recently touted by Surface VP Panos Panay as “The tablet that can replace your laptop”, the latest incarnation of Microsoft’s “Dream the impossible” initiative landed in US stores and online last week to expectant and intrigued consumers. Everyone seems to have the same lingering question on the brain: will the latest version of the Surface mean game over for the traditional laptop? Having owned a Surface Pro 2 for six months now, I can attest to a number of frustrations that, despite its attributes, have ultimately left me running back to my MacBook and iPad. Let’s start off with the screen. For me, it was just too small. I mean really—way too small. The 16:9 ratio was great for watching movies, but seriously limits working space, increases distraction, and oddly, didn’t operate well in portrait mode. Power was a big problem, as it rarely lasted more than 5 or 6 hours. Whether you’re working or playing (or more likely, some combination of both) that just doesn’t cut it. 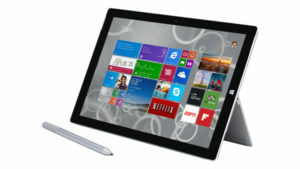 Size and weight are understandable given that it offers the processing of a PC in a tablet format. Nonetheless, it’s just not convenient enough to be worth it—using the Pro 2 with one hand was difficult and tiresome. Lastly is it’s “Lapability”, a phrase increasingly touted by Microsoft. As cute as the commercials were, the reality was perhaps the biggest killer for me. It just didn’t work the way I imagined it would. With the two angles of the kickstand and somewhat flimsy cover, the overall experience was a bit awkward and might cause more problems than it solves. For starters, all of the above issues have been addressed to some extent. The screen has been increased in size to 12 inches in a 3:2 aspect ratio, a first for any device of its kind. According to Microsoft, it also offers the best representation of a piece of paper for a better reading experience indoors and out. The full HD screen sports a much higher resolution—2160 x 1440 to be exact. This, combined with some clever resizing in Windows, means you actually have 6% more useable “work space” than a 13.3inch MacBook air screen. The new architecture and enhanced battery means a claimed 9 hours run time. In reality, I’m seeing 7-8 hours, which is still an improvement over the previous version. 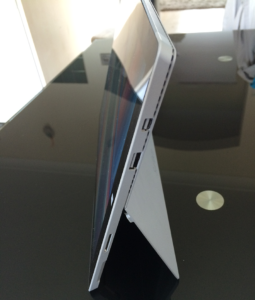 Size and weight must be one of the most impressive new features of the Surface Pro 3. Coming in at just 800 grams and just 9.1mm thick, this is the thinnest Intel Core product ever made. Finally, “Lapability”. This is something that was presented in equal parts detail, vigour and enthusiasm at the release event. To his credit, Panay was keen to demonstrate the previous issues with using the Pro 2 on your lap and how these have now been solved. The new friction based kickstand is a feat of engineering. Itallows the full range of movement to an astonishing 150 degrees. So along with a newly redesigned Type Cover, you now have a more rigid and adjustable Surface to accommodate lap usage. The Pro 3 comes in three processor configurations, all of which use Intel’s Core line of processors: the i3, i5 and i7. Options begin at 4GB of RAM with 64GB of SSD storage, all the way up to 8GB with 512GB of SSD. Though the i3 machines retail at $799, it’s clear already that the best “bang for the buck” is the i5 version with 8GB of RAM and a 256GB SSD drive retailing at $1299. I’d say it’s highly likely that I’m within the consumer range Microsoft’s Surface R&D team focused on targeting when developing the Surface 3. So the killer question after using it as a full time machine for 2 weeks, can it really replace your laptop? The answer is a resounding yes. But maybe not for everyone. The engineering marvel which has made the Pro 3 unbelievably light and thin is astounding. I can take this to bed, watch films, browse the internet, play games, all the things I did on my iPad. But, when I’m ready to work, I have all of my applications and OS I’m used to and the power to use it all. The screen works perfectly and I can sit for hours working without feeling strained or tired—something that was impossible on the Pro 2. The new pen is also great to use, as it feels more like a real pen than the previous version. It also offers clever features that make it accessible and easy to use. For instance, your Pro 3 will “sleep” to conserve battery life, without preventing you from instantaneous use: you can capture notes on OneNote and upload them to your OneDrive even when your Surface is asleep; simply tap the command button. 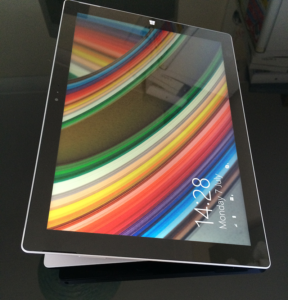 Overall, the Surface Pro 3 is an excellent improvement on its predecessor. For many consumers, this really could be the final frontier for diverse portable technology. Microsoft has achieved the mark of true innovation—something which Apple seem to be lacking over recent years with its constant iterations of the same laptop and OS. Despite its merits, will innovation alone be enough to tempt fruit-logo-die-hards from ditching their multiple devices? Probably not. Yet. And that’s a shame. But for those who are more concerned with function than kitschy branding—I say go for it.